What makes a conscious business, and what barriers stand in the way? Conscious Brands tapped the collective intelligence of the Expo West community to find out. On March 9, 2017, at Natural Products Expo West, Conscious Brands hosted 75 bold leaders and visionaries in an educational session entitled, "Co-creating an Industry of Conscious Companies: A Generative Dialogue." The call/idea to host such a workshop came from identifying trends through conversations we have been part of at the MegaFood ZingMojo conference, Esca Bona, the CHFA (Canadian Health Food Association) East and West and with clients, and general ponderings around what an industry of conscious companies could look like. In our work of helping businesses approach harmony (a flourishing, responsive and regenerative economy) we have come across many frameworks (The Natural Step Framework, Future Fit Business Benchmark, B Corp certification, etc.). With that, we have arrived at five principles of a conscious company. exists for a reason bigger than itself—a higher purpose. is transparent and in high integrity in its service to its purpose. is aware of all stakeholder impacts. is committed to expanding its awareness of the full scope of its impacts. actively confronts disconnects, and is constantly moving toward harmony. At the education session at Natural Products Expo West, as participants entered the room, they knew this would be a different experience from the other education sessions at the show. Rather than present as experts on the subject, our intention was to seek and capture collective intelligence in the room for all to grow from. We began by breaking the chairs out from the traditional theatre style seating and placing them into small groups. Afterward, we gave a quick introduction of what Conscious Brands is and an overview of the session, and then led participants through a quick meditation. After stillness in the room (and the self) was established, participants were asked two questions: What are the ENABLING forces on consciousness in the industry/ in your business? What are the INHIBITING forces on consciousness in the industry/ in your business? For the first round of questions, we started with an individual experience of brainstorming answers, then asked participants to pair up and collectively choose their top five enabling forces and their top five inhibiting forces. As a whole, we identified more than 300 different points. The participants then came up to the wall, where we had a matrix for each force, and mapped where they thought their force best fit. The matrix was laid out with the strength of the force on the x axis and the ease of shift on the y axis. Directly after the session, Conscious Brands, along with a couple participants that stayed behind, took all the points and clustered them into the theme areas. Listed below (in no order of importance) are the theme areas that were established. 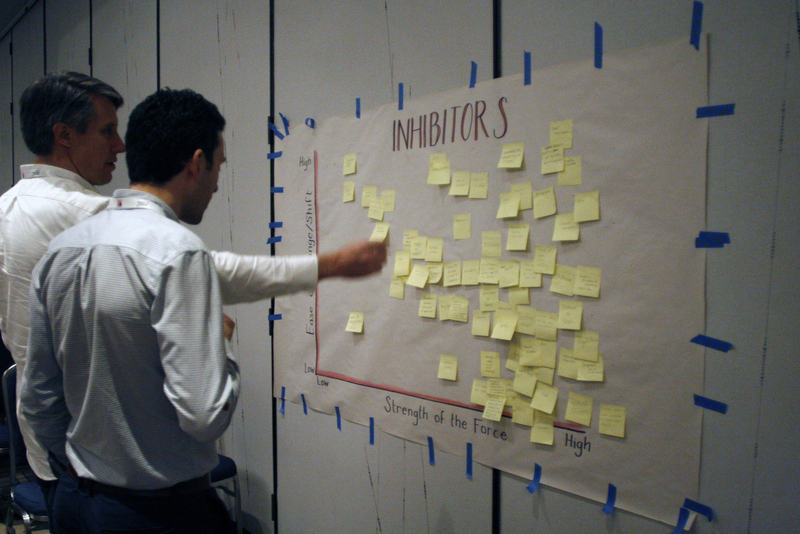 Then we plotted the highest leveraged inhibiting and enabling force theme areas according to how they were plotted at the session by the participants. The matrix is laid out below with the strength of the force on the x axis and the ease of shift on the y axis. 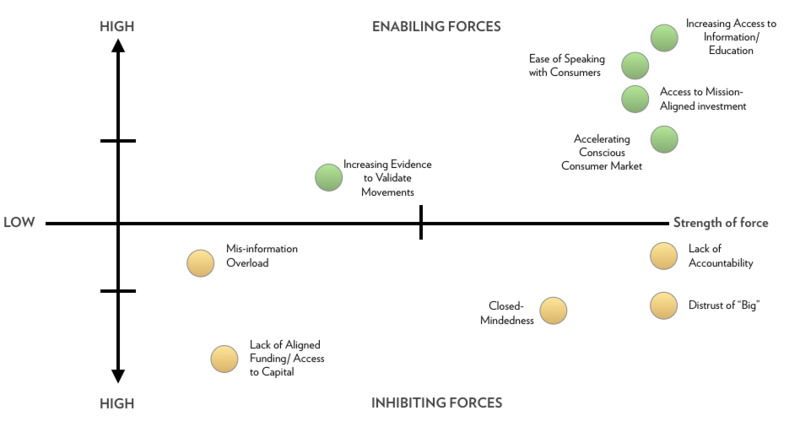 Those forces in the top and bottom right have the highest leverage points. For example, one of the top-rated inhibiting force on consciousness in the industry was lack of accountability. This looked at industry lobby/political force and marketing, regulations, the current political climate and that the lack of regulation in certain areas is hurting the consistency of products. To interpret this would mean that if there was more accountability in what is being said and how companies are acting in the industry, there would be greater shift, or acceleration, toward a conscious industry. For the enabling forces, one of the top-rated on consciousness in the industry was that there is increased access to information/education. This looked at trusted alternative media having good role models, scientific evidence and availability of knowledge and the abundance of resources available. Our next round had people gather into groups of four or five and discuss the question, “What is the conscious industry that we desire to co-create?" Each group came up with the top two characteristics of success for this industry and plotted them on a separate sheet. Purpose-driven/led - This looked at organizations having a higher purpose (beyond profit); decisions based on purpose/mission and not only profits. Integrity to purpose - This includes ethics and morals with awareness and integrity in action and advocacy: companies speaking for the people; adding value and not just paying people; sitting in government forums and engaging regulator and taking the lead on ethics/values/accountability. Access to food and livelihood for all - This included access to all food for all (big companies and small) and support communities: provide/promote equal accessibility of resources (e.g. food, housing, water); education of consumers; simple and succinct; fair wages for employees. Redefining success in business - Conscious capitalism and redefining success to have a healthy balance profit with being mindful of triple bottom line; longevity and viability of company, community and planet. Transparency - Sharing supply chain traceability; sharing what is happening behind the scenes at the organization. Commitment to environment - Having a strong commitment to sharing and educating about environmental sustainability (in different communities, sourcing production distribution); the climate collaborative. Aligned value chain - Aligning of value chain. Inclusion and relationships - Having value relationships with customers, vendors/ suppliers, partners, the earth and employees by hiring/partnering for culture (common beliefs). This is a first draft and the aim is to build on it with more people, more perspectives, more of the industry, etc. It will be through ongoing conversations that we make it more and more complete. How are you committing to co-creating and industry of conscious companies? We would love to hear your feedback, both on what has been done to date and to understand where the gaps are. If you are interested in being part of this emerging conversation, please get in touch, or join us at our upcoming webinar, A Deeper Look at the Industry's Consciousness: Building on Discussion from Natural Products Expo West, from 10 a.m. to noon MST on Thursday, April 20. Registration is required as spaces is limited to 40 BOLD natural products leaders. Learn more and register here. A rebuttal: Conscious consumerism can save the world. Here's how.